Our Boutique collection is one of our oldest designs. It is a simple design with satin ribbon and normally made with a sparkling, square, diamante cluster embellishment and personalised with your names. Clive and Rob contacted us last year and asked us to make their wedding invitations in our Boutique collection in cornflower blue in a wallet style, but asked for a couple of changes to be made. They wanted to change the square embellishment to a crystal heart and wanted an extra layer on the insert to incorporate more of the cornflower blue. The result looked lovely and we will be working on the matching place cards later this year. 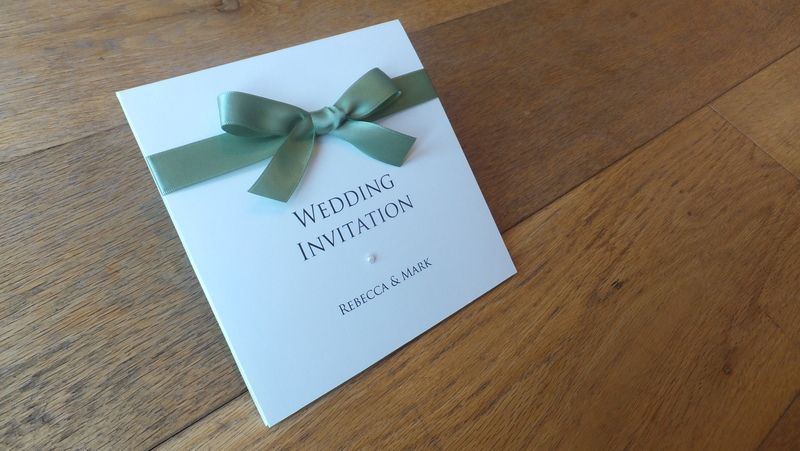 All of our wedding invites are available as a pocket, wallet, folded or flat style with the ribbon available in many colours and you can also change the embellishment to suit. We have a large selection to choose from on our website. 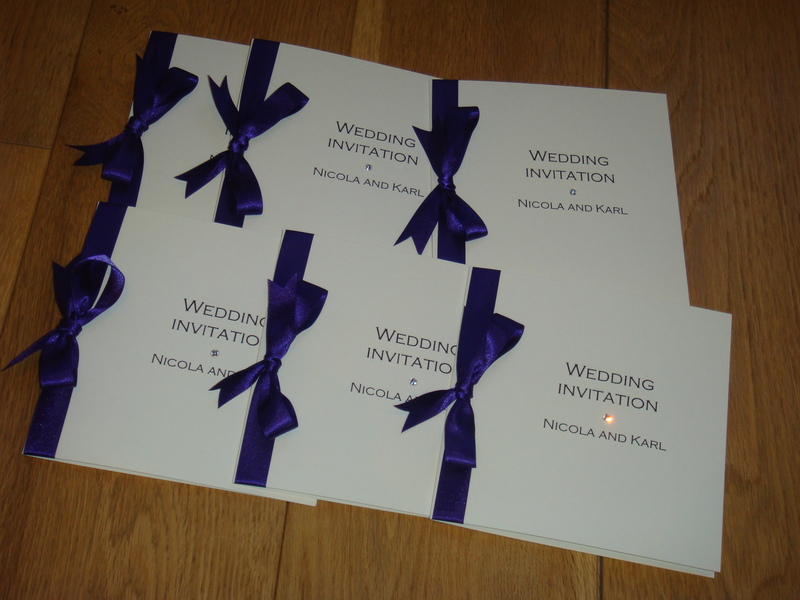 A full range of wedding stationery can be made to match including table plans, guest books, menu’s, post boxes. I’m so sorry it’s taken me so long to send you this message but I’ve been in hospital for quite a while. Thank you so much for the invites they are absolutely beautiful- a work of art. Do you want me to leave some feedback anywhere? Thanks again- I have passed your name onto a couple of people if have seen my invites. They really have the wow factor! Our Cupid collection is a popular choice with couples. It is elegant and simple but with the right amount of romance and sparkle. 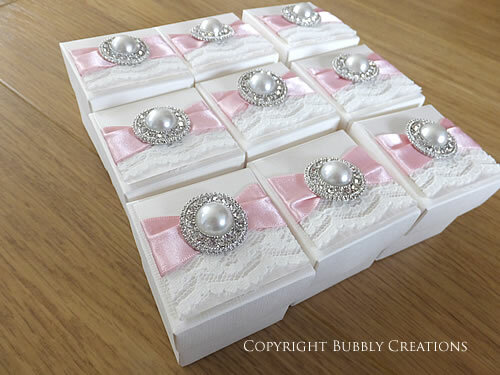 It is made with pearlescent card, lace, satin ribbon and finished with a diamante and pearl embellishment. 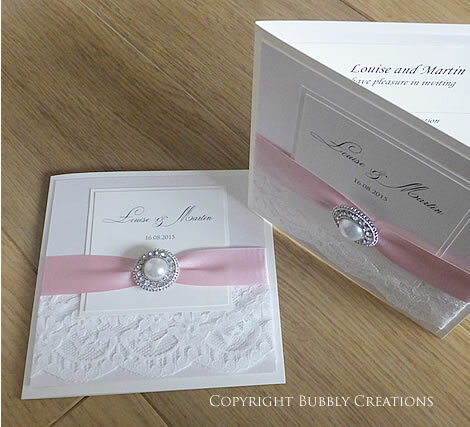 Louise contacted us earlier in the year and asked us to make her wedding invitations in our Cupid collection. 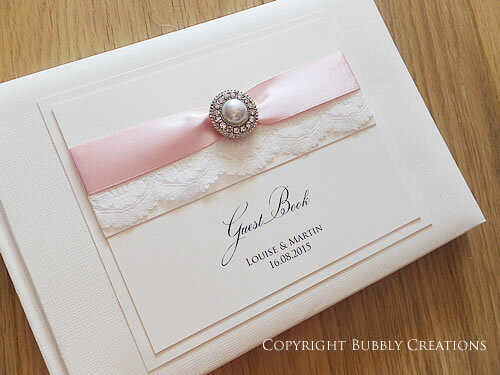 She chose to have the quartz pearlescent card with a pale pink ribbon and chose to have a folded invite style. She also booked in to have us made her on the day stationery which included matching favour boxes, place cards and a guest book. The matching invites that we had made earlier in the year. Matching place cards in our Cupid design using the pearlescent card and personalised with the guest names. 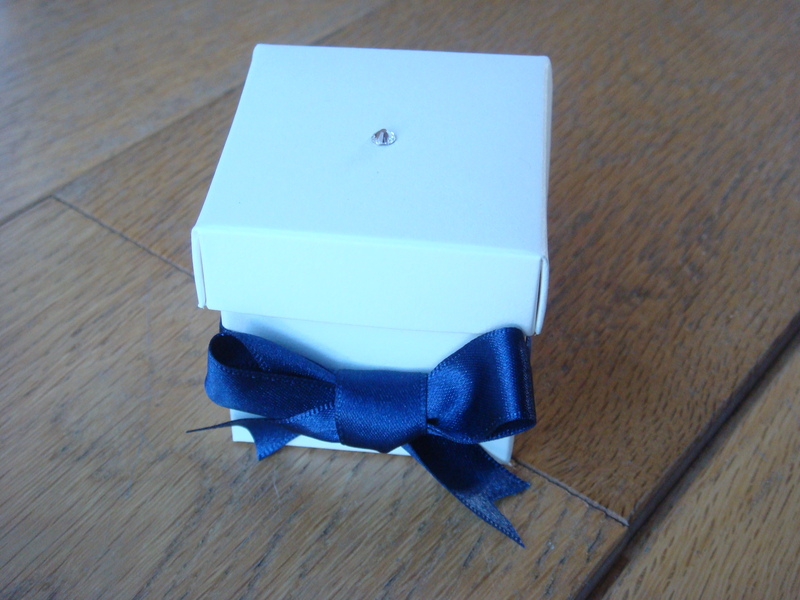 We don’t have favour boxes on our stationery list, but as Louise asked us to make them for her we did. Measuring 5 x 5 cm with a decorated lid. We also made a matching wedding card post box. 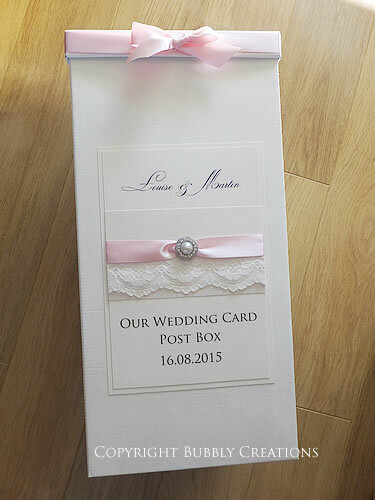 These measure 50 x 25 x 25cm and have a slot at the top of the box for the cards to be posted. Lastly, we made a matching guest book in the same design to match all of her other stationery. It comes with a presentation box. 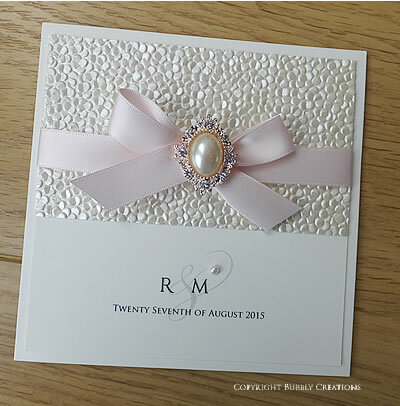 Our Crystal Pebble wedding stationery collection was new for 2015 and has proved popular with couples this year. Made using the embossed paper, a satin ribbon bow and finished with a gold pearl embellishment. This embossed paper is stunning with its raised pebble look on pearlised paper, it adds a new dimension to the design. A top trend for this year are the gold embellishments and the intricate pearl embellishment used on this design proves why. 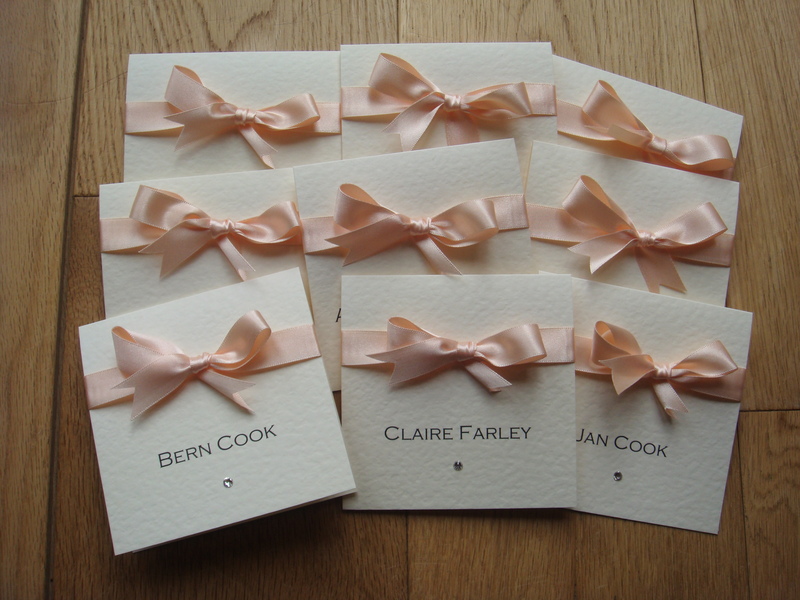 The pebble paper is available in many different colours including white, ivory, pink and silver. We are often asked to make this using the more neutral tones, but sometimes silver which looks wonderful. The photos do not do the paper or the embellishment justice. 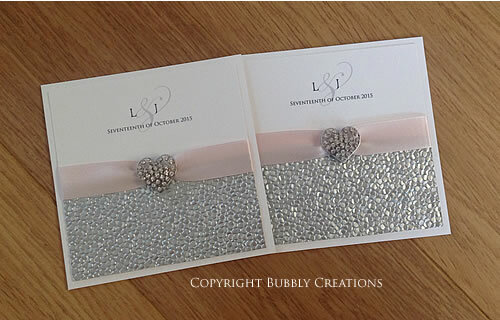 Here is a wedding invitation order using the silver pebble paper with blush pink ribbon and a diamante heart. This customer tweaked this design and asked us to put the decoration at the bottom of the card, use the silver embossed paper and use a large diamante heart embellishment instead. She ordered flat style invites but wanted to have them double sided so she could have the full design on the front. 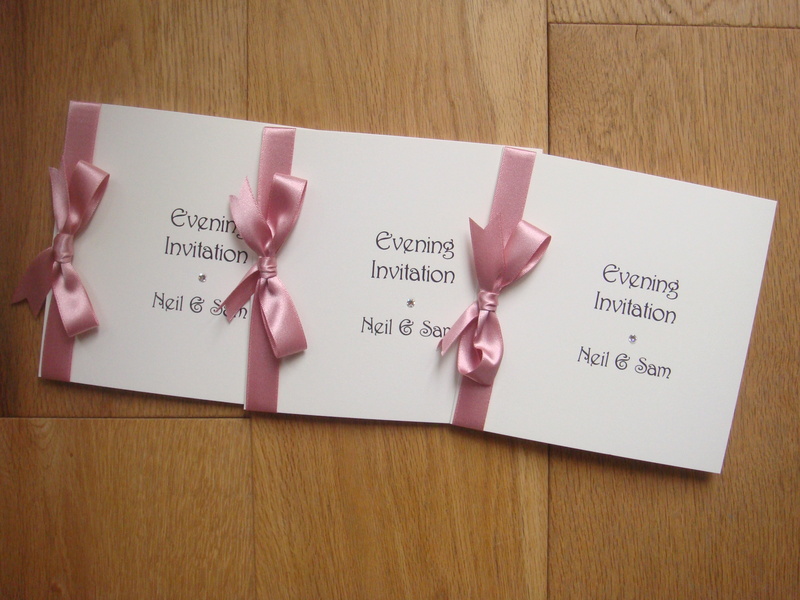 We can make any of our invitations as a pocket, folded, wallet or flat style. 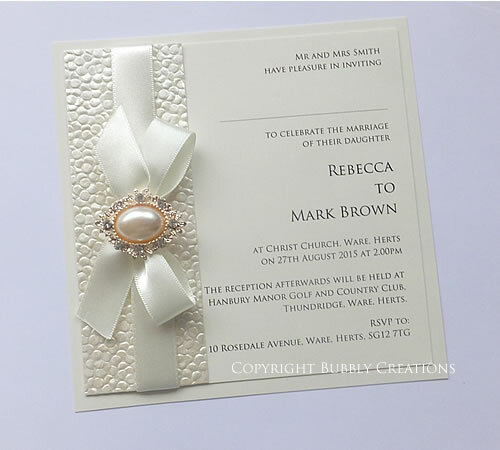 This is the standard flat style invite shown in all Ivory. This is the folded style in ivory but using silver satin ribbon instead. We can change the ribbon colour or the pebble paper colour. Here is an order we made using the pocket and flat style in cream and midnight blue. We offer a full range of wedding stationery in any of our designs including table plans, guest books, menu’s, order of service booklets and place cards to name a few. All made to match your invitations. Our Cupid collection is on our most popular as it is an elegant design and is perfect for the very popular vintage lace and pearl wedding theme. It is made with a pearlescent card in the colour of your choice, luxury lace with a large pearl and diamante embellishment. 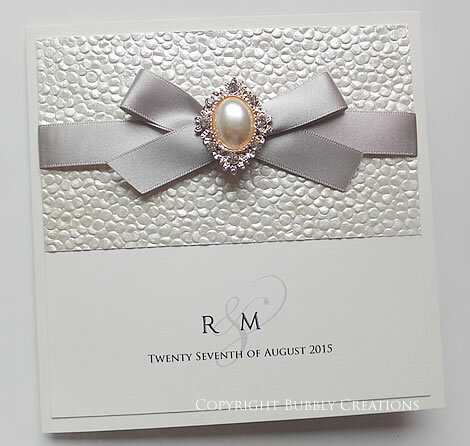 It is finished with a personalised plaque on the front and matching pearlescent card on the inside. We were contacted by Rebecca in early 2015 who asked us to make a full package of wedding stationery for her wedding in August. 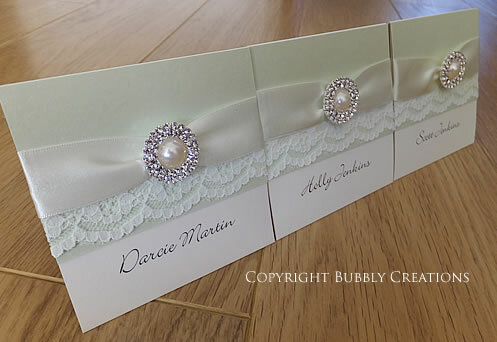 She chose our Cupid collection and decided to have the backing card in a Pistachio green with ivory ribbon and went for a slightly different pearl and crystal embellishment which had a little more sparkle. 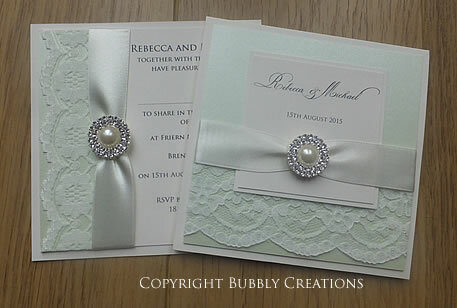 We offer flexibility on all of our designs so you can change the embellishment, card or ribbon colour. Firstly we made her pocket day invitations and her flat evening invites and then later in the year we started on her on the day stationery. Rebecca chose to have a matching table plan, place cards, menu and table name cards all in the same design. 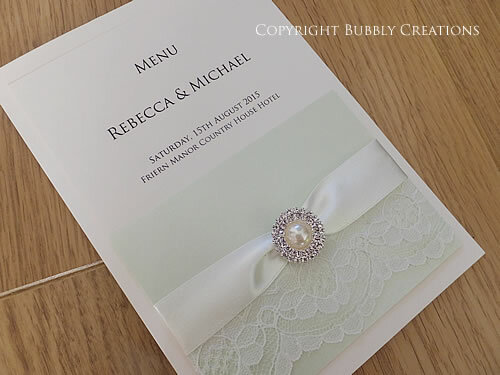 Our Crystal Bow range is one of our oldest collections and remains on our books as it is timeless and sometimes a couple just want a very simple and budget friendly invitation. Our Crystal Bow range has always been popular with couples as it is a classic style of wedding invitation which doesn’t date and doesn’t follow any sort of theme or trend and is therefore timeless. It is also one of our most budget friendly designs which is always appealing to couples. 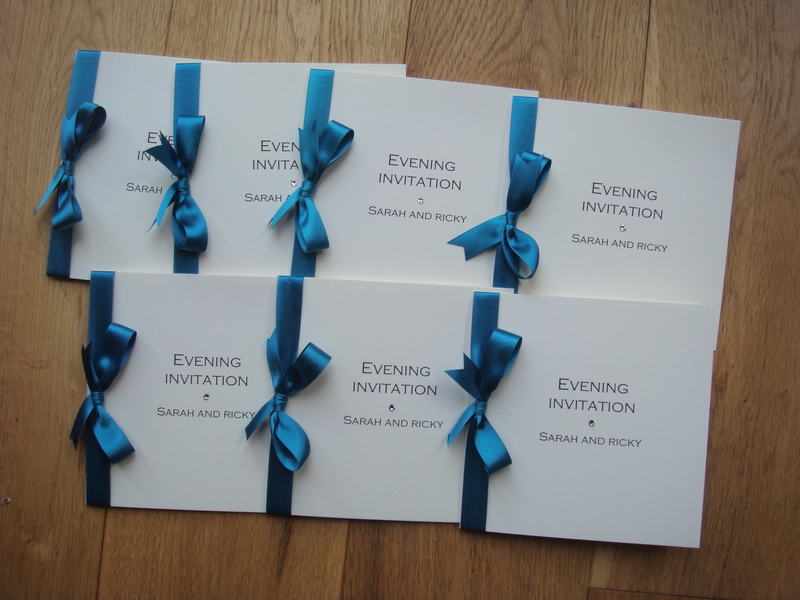 We have completed quite a few orders in this design recently from invites to on the day stationery. 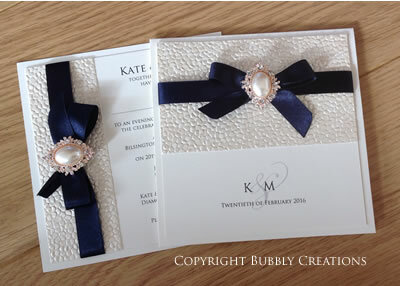 The Crystal Bow collection can be made as a pocket, wallet, folded or flat style invite and is made with a satin ribbon bow, a diamante and is finished with your personal details. 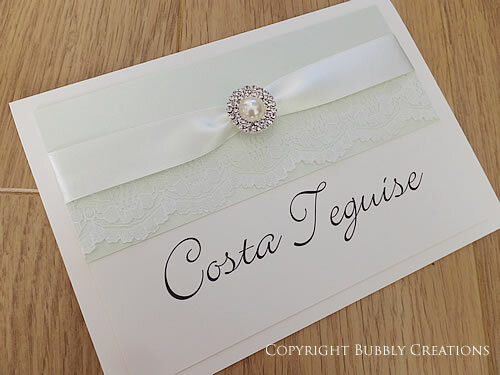 The card comes in White, Ivory or Cream and the ribbon is available in a variety of colours. You can also choose between a pearl or a diamante to finish the design. Our table name cards can also be made as numbers. You can choose between White, Ivory or Cream card and we have a large range of satin ribbon to choose from. We can provide a full range of wedding stationery to match any of our invitation designs from day or evening invites, rsvp cards, additional inserts, menu’s order of service booklets, place cards.